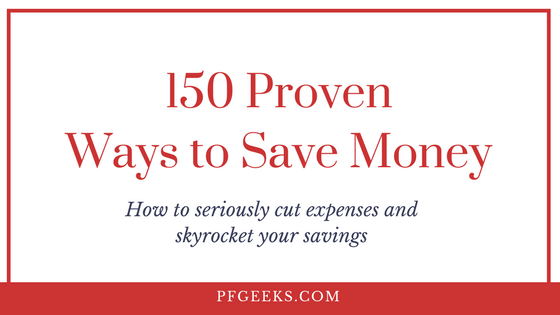 I don’t know about you, but I’m a bit obsessed with finding easy ways to save money. At this point, we’ve got the big things covered like housing and transportation. Now we’re on a mission to save money on all of our regular spending on things like food, gas, clothes, gifts, etc. We’ve already been able to lower our grocery spending by about $200 a month thanks to a few small habits: meal prepping, reducing food waste, and sticking to a strict limit on house improvements. We started tracking our spending again and we’ve already seen some small improvements! Our mindset is to constantly be on the lookout for ways where we can improve our finances by 1%. Over time, those 1% gains start to add up big time. They begin to compound and build on each other. The gold standard is when you can do this without any extra effort. If you want to save more money with almost zero effort, then you’re in for a treat today. I used to think things like cashback cards and cashback apps were scams. But I’ve totally changed my mind. Getting cashback on everything you buy is probably the easiest way to save money. It literally takes zero effort and you save money. If you’re looking for a way to start getting cashback on everything you buy, then you’re in the right place. I’ve been meaning to write an ebates review for a while now and I’m excited to share how it’s saving us money. If you’re here to get a quick free $10, then go ahead and use my ebates referral link and join up right now! 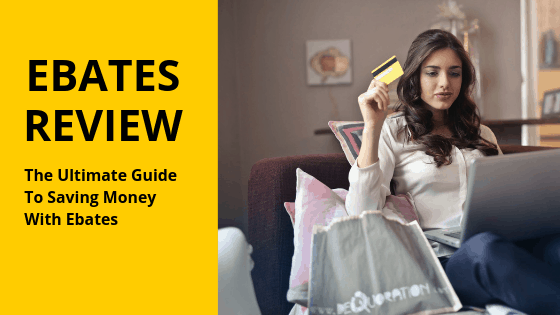 Then come back to the guide so you can figure out all of our tips, tricks, and favorite ways to save money with ebates. Ebates is a company that has partnered with thousands of businesses to form an affiliate relationship. This means that whenever they “send” buyers to websites they get a small commission of the sale. Rather than keep all of that to themselves they split it with you, the buyer! Ebates is legit and incredibly simple. Ebates is partner with popular brands and when you shop through the site, in-store, or use the Chrome extension (the best way to use ebates), you get cashback for your spending. The rates typically range anywhere from 1-10% cashback but can sometimes be way higher. To date, they’ve helped over 10 million people earn over $1,000,000,000 in cash back. YES! That’s $1 billion. With a B. The company was founded in 1999 back when the internet was barely a viable concept and they’ve exploded over the last 20 years! They are on a mission to help shoppers save money on the things they buy every day! Long story short… Ebates is all about helping the average person save more money on their regular spending. I’m all about that and am a big user myself. The first step to earning cashback from Ebates is obviously to sign-up and join! I’d totally appreciate it if you used my ebates referral link to sign-up. You’ll get a free $10 once you shop through their platform! As soon as you’re signed up, you can shop online just like your normally would but now you’ll be earning cashback on everything you buy! The great thing about ebates is that you actually get straight cash back. Not gift cards or store credit or other forms of payment. You get more dollars back in your bank account. Now that you’re signed up, you’re ready to shop! Thankfully Ebates makes it super easy. There are 3 ways you can use their platform. You can go to Ebates.com and do a search for whatever store you need to buy something from. You’ll then be able to see how much cashback they’re offering and you can click through to go to their site! Click the “shop now” button and you’ll be directed to the website you’re shopping from and then you’ll get a notification saying that you’re on your way to getting cashback! The easiest way to use Ebates to get cashback is to download their chrome extension. This way you don’t have to go through the Ebates website each time and whenever you’re online, they’ll notify you when there is cashback available! This is definitely the best way to use ebates because you’ll never miss a deal! 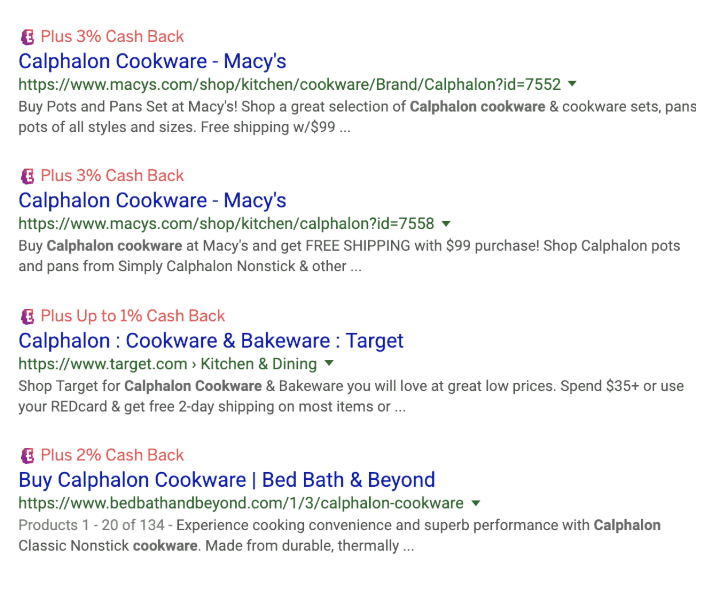 When you have the chrome extension installed, then it will also show the cashback rates available whenever you are searching in google. This way you can instantly see where the best deal is! I’ve been using Ebates for a while now and I actually didn’t know that you could shop in store! 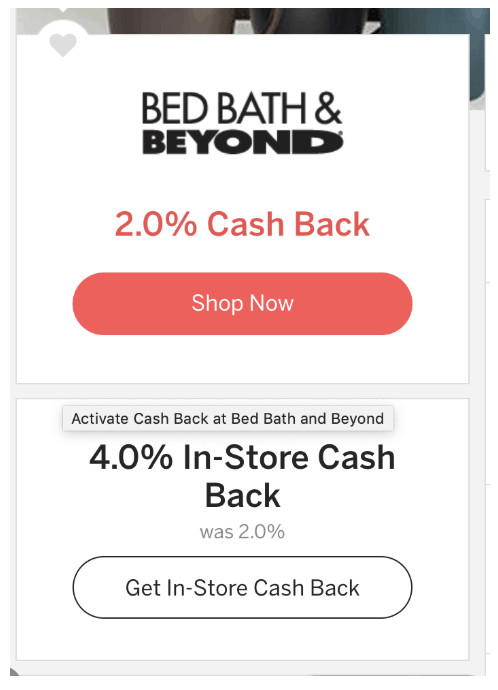 In some cases, the in store cash back rate is actually higher than online. I’m guessing that could be because they save money by not having to do free shipping? To shop in-store, you simply link a credit card to your ebates account and when you find an in-store offer, link that specific offer to your card. When you make the purchase in-store, Ebates will automatically give you the cashback into your account. With Christmas shopping, home renovation, and buying gifts for our nieces and nephews, we’ve been able to really maximize our cash-back. Here’s a quick snapshot of some of the stores you can use ebates at. Almost every chain or popular store I could think of is partnered with Ebates! Getting cashback isn’t the only thing Ebates can do for you. With most of the companies that they are partnered with, they have additional deals and clearance sales that help YOU save even more money. At the time I’m writing this, they have a deal with Bed Bath and Beyond where you can get $70 off a Nest thermostat in addition to the 2% cashback! 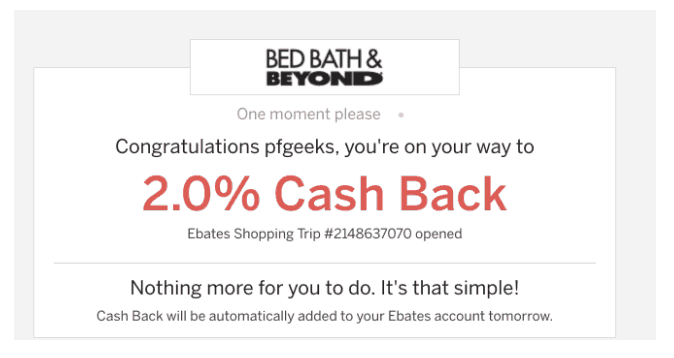 Over time, the cashback will collect in your ebates account. As long as you’ve earned more than $5, you’ll get paid. The money will stack up over time as you continue to earn cashback. They do payouts every 3 months and you can opt for either a physical check or you can set up a paypal account with them! I recommend setting up the paypal so that you don’t have to worry about checking the mail. No one is going to build up their retirement savings or save for a downpayment from Ebates cashback. If you want to make those kinds of savings, you’ll need to find a way to boost your income and really build up your savings gap. The great thing about cashback is that it feels like free money. And when you sign-up, they’ll actually give you a free $10 sign-up bonus! We use the cashback we get to buy furniture, decorate our house, go out to eat, or even invest back into this blog! They’ve been around since the internet was in its baby stage and they’ve given out over a billion dollars in cashback to millions of users. With any product or tool, it’s good to really dive in deep to know the pros and cons. Ebates is a super legit tool for getting free money, but it ain’t perfect. The app is completely free to use. All it takes is an email address or facebook account to sign up! Ebates is EASY to use. It takes truly zero effort if you have the chrome extension installed! Other cashback apps take effort like scrolling through and looking for applicable deals. With the ebates chrome extension, it’s as easy as clicking one button whenever they notify you of a deal. If you refer ebates to friends or family, you can also start to earn a bit of extra money! As soon as you sign-up, you can get your own ebates referral link to share with people. Partnered with thousands of companies. Ebates has a huge network of affiliate relationships that you get to benefit from. Now, time for the cons. Their partnerships don’t last forever. About a week ago I got 4% cashback when i bought a bathtub from Lowes, but it seems like they are no longer partnered with the company. No idea why! It does take quite a while to get your cashback. 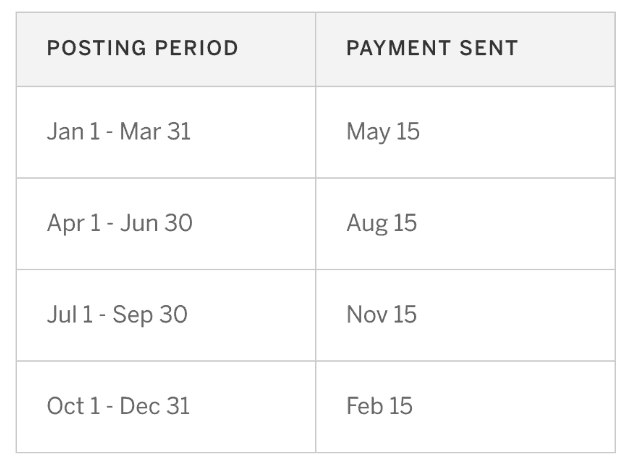 Four payouts a year is pretty infrequent, but hey! That just means the checks are bigger whenever they do come in. Resisting the temptation to buy stuff you don’t need is one of the common challenges with any cashback app. My father in law often jokes that he is going to go broke from “saving money.” A 5% discount on something you need is awesome! But keep in mind that it is still 95% on. My friend Olivia from BirdsofaFire gave me the idea to start “cashback stacking” whenever I buy anything online. Getting cashback from ebates is awesome on its own. But you can really rev up your savings by combining it with some other deals out there. You use ebates to buy a discounted giftcard (2-10% off) through a site like Gift Card Granny or Giftcards.com! Buy the giftcard using a cashback credit card (1.5-2% cashback). Then go to the site you want to buy something from and activate the ebates cashback (1-10% off). Before you check out, use the Honey app (another discount app that uses a browser extension) to get another 5-10% off! When you stack back up all the cashback and discounts, you’re getting almost 20% off the full price. It may not be worth the effort on small stuff but we dropped over a grand last week on supplies for house renovation and saved $200 with about 5 minutes of effort. The only thing better than getting cashback on your own spending is to get cashback back after using someone else’s money! If you do a decent amount of spending for your employer, then make sure to go through Ebates to make all of your purchases! Sign-up with Ebates today to start earning cashback on all of your regular spending! This is one of the easiest ways to save money over and over again without any extra effort. Get a free $10 for signing up, install the extension, and you’ll save money next time you buy anything!